An Atlas 5 rocket holding a U.S. Air Force X-37B space plane in its nose cone sits on the launch pad in Floriday on Friday, March 4, 2011. Bad weather delayed the launch, with another attempt coming March 5. This story was updated at 5:35 p.m. EST. Bad weather in Florida thwarted the U.S. Air Force's attempts to launch its latest secret X-37B space plane Friday (March 4), forcing a one-day delay for the robotic reusable mini-shuttle. The unmanned X-37B space plane — known as Orbital Test Vehicle 2 (OTV-2) — was supposed to take to the skies from Cape Canaveral at 3:50 p.m. EST (2050 GMT) today atop an Atlas 5 rocket. But cloudy, windy conditions caused officials to scrub that attempt, as well as a second try around 5:30 p.m. EST (2230 GMT). 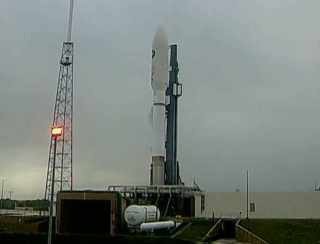 "We made a valiant attempt, but the weather is not cooperating for today," a launch controller said. The foul weather didn't catch mission planners off guard — Air Force officials had said in the days leading up to the launch attempt that there was a 70 percent chance of a delay caused by weather. The next launch opportunity comes tomorrow (March 5) at 4:09 p.m. EST (2109 GMT), ULA officials said. But the lousy weather could still be a problem, with launch controllers estimating a 70 percent chance of another weather delay. With its blunt nose and stubby wings, the unmanned X-37B spacecraft resembles a miniature version of NASA's space shuttles. The X-37B is about 29 feet long and 14 feet wide (8.8 by 4.2 meters), with a payload bay about the size of a pickup truck bed. It is designed to launch vertically inside the nose cone of a rocket, stay in orbit for months at a time, and then land horizontally on a runway like a space shuttle. The X-37B's cost, payloads and missions are classified. Partly as a result of this secrecy, some concern has been raised—particularly by Russia and China—that the vehicle is a space weapon of some sort. But Air Force officials have repeatedly denied that charge, claiming that the space plane's main task is to help test out technologies — such as new guidance, control and navigation systems — for future satellites. Some experts think the X-37B is trying out hardware for next-generation spy satellites, which would explain all the secrecy. Boeing's Space and Intelligence Systems division builds the X-37B for the Air Force. Originally, NASA used the space plane as an experimental test bed until funding for the project ran out in 2004. The vehicle then passed to the Defense Advanced Research Projects Agency and was ultimately turned over to the Air Force in 2006. The United Launch Alliance will provide live coverage of the next attempt tomorrow. Watch the webcast here.